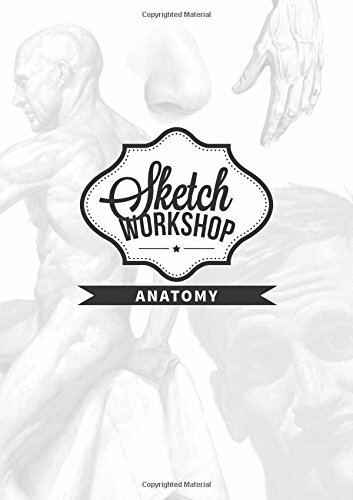 The Sketch Workshop series from 3DTotal Publishing is the result of a successful Kickstarter campaign they launched in 2013. This particular book is actually part of a set of 5 books covering different subjects, namely anatomy, characters, creatures, cityscapes and robots & spaceships. In that Kickstarter campaign, the 5 books come in a leather-style folder. For those who did not back the project, 3DTotal has also made the books available separately at a more affordable price. The books are spiral-bound vertical format workbooks. Each one features a few instructors and has 48 pages. This particular book that covers Anatomy features instructors Ryan Lee, Ron Lemen and Matt Smith. They are all accomplished artists and you can tell from their art in this book and the portfolio on their websites. Yeah. Just those four areas. As the book is spiral and in vertical format, the tutorials are laid out in such a way that, when the book is on the table, the instructions appear at the top page and the drawing templates are at the bottom page. It's a smart design that lets you draw on the bottom page while at the same time allowing you to refer to the instructions. There are many useful drawing tips throughout. Since you're expected to copy what you see, you can get a good idea of your progress by comparing it with the examples. The drawing templates are actually just faint outlines of the illustrated examples. Sometimes you'll be told to draw in the details, and sometimes to practice shading and lighting. If you run out of templates or space on the book to draw, you can download additional templates to print out at 3DTotal Publishing's website. It's not a comprehensive book. But for the subjects that are taught, they are taught well. Considering the affordable price, it's a good deal. It's a fun hands-on book on learning. I wish there could be more pages of content though.